Create Glowing Water With This Simple Experiment. It's easy to make glowing water to use for fountains or as the basis for other projects. Basically, all you need is water and a chemical to make it glow. Here's what you need to do. 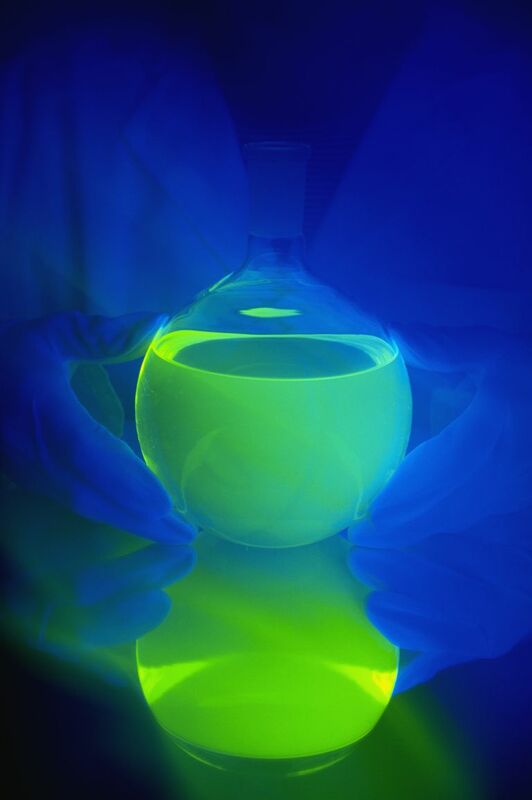 There are a couple of ways you get science projects to glow in the dark. You can use glow-in-the-dark paint, which is phosphorescent and glows anywhere from a few minutes to a few hours. Glowing paint or powder tends not to be very soluble, so it is good for some projects and not others. Tonic water glows very brightly when exposed to black light and is great for edible projects. Use a knife to (carefully) cut a highlighter pen in half. It's a pretty simple steak knife and cutting board procedure. Pull out the ink-soaked felt that is inside the pen. Soak the felt in a small quantity of water. Once you have the dye you can add it to more water to make glowing fountains, grow certain types of glowing crystals, make glowing bubbles, and use it for many other water-based projects.